You may be carrying a credit card embossed with the name “Visa Signature®” on it, but have you ever wondered what exactly that means? Sure, Visa is one of the major payment networks, the others being Mastercard, American Express and Discover, but what does the “signature” part represent? Turns out, Visa Signature® is a select package of benefits offered by the Visa payment network to the holders of premium credit cards. These features are above and beyond the set standard benefits offered to all other Visa cardholders. Let’s take a look at some of the popular benefits of Visa Signature® credit cards and see if they can save you money. Beware that all the benefits mentioned in this post may not be available with every Visa Signature® card. 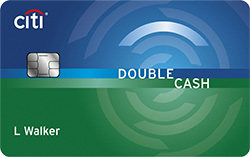 Check with your issuer to see exactly which benefits your card offers. Benefit summary: Visa Signature® cardholders can call 1-800-847-2869 and be connected to an exclusive roadside dispatch service. The dispatch will connect you to a reliable service provider that can assist you with a variety of auto emergencies. Cardholders pay a flat $69.95 fee for the service call, though there may be additional charges based on the service provided. Our thoughts: Having the Visa Signature® Roadside Dispatch® service at your disposal can provide peace of mind whenever you’re on the road. However, the service is not cheap – most people would agree that paying $69.95 to get your car jumped is a bit expensive. When you consider the limitations and extra costs like the short towing distance and paying for the cost of the fuel, the roadside dispatch benefit pales in comparison to more inclusive programs like AAA. Nonetheless, you don’t pay a penny unless you use the service, so it’s nice to have in case you ever get stuck. However, the Visa Signature® Roadside Dispatch® isn’t the most cost-effective way to get a helping hand on the highway. Benefit summary: If you lose your luggage while traveling, Visa has you covered for up to $3,000, or $2,000 per bag. It’s important to note that this benefit only applies if you’ve paid for your travel reservation with your Visa Signature® credit card. Also, this serves as a secondary policy, which means that you receive compensations for the difference of the value of your items and reimbursements that are not covered by the airline or other insurance policies. Our thoughts: It’s always important to read the fine print with any insurance policy. The Visa Signature® lost luggage reimbursement is a nice added benefit on your credit card, but it may not cover everything lost in all situations. And, if you end up filing a claim with your primary insurance prior to this benefit, you may see an increase in your premium. Always try to keep your most valuable items with you as much as possible while traveling. Benefit summary: Visa Signature® credit card holders can call 1-800-992-6029 to receive myriad benefits and services to assist with your travels. The services include pre-trip assistance, medical referral assistance, emergency transportation assistance, emergency message service, prescription assistance and valuable document delivery arrangements, legal referral assistance, emergency ticket replacement, lost luggage locator service and emergency translation service. Consult your Visa Signature® benefits guide or call the number on the back of your card for a more detailed description on what these benefits encompass. Our thoughts: There are some interesting perks wrapped up in these Visa Signature® travel and emergency assistance services. Overall, these benefits seem a bit random and most cardholders will probably never use any of these services. A quick Google search could probably get you the solution you’re looking for, but in certain situations perks like emergency translation service or medical referral assistance could really come in handy. Benefit summary: Get covered for damages caused by collision or theft on your rental car by putting your car on your Visa Signature® Card. You must also decline the rental company’s collision damage waiver if it’s offered, and specialty rentals like trucks and luxury cars may not be covered. Like most auto rental insurance policies on credit cards, you receive “secondary coverage,” which means you must first utilize any other insurance you have to cover the damage, but you may be reimbursed if there are any leftover costs. Our thoughts: This is definitely one if the more useful Visa Signature® perks as it can save you money every time you rent a car since you won’t have to pay for coverage from the rental company. If you are a frequent traveler, this benefit can really come in handy and is a solid reason to carry a Visa Signature® credit card. But if you want even more auto rental coverage through your credit card, consider using the Chase Sapphire Preferred® Card. This is one of the only credit cards that offers primary auto rental insurance, which allows you to forgo using your personal insurance coverage. Benefit summary: This Visa Signature® perk is pretty self-explanatory and it’s not too much to get excited about. 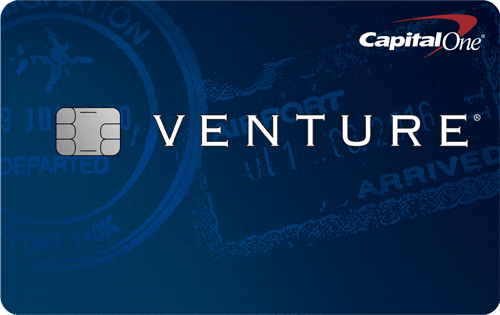 With any Visa Signature® card, you get a comprehensive summary of your statements throughout the past calendar year. The summary breaks down your purchases and provides some analysis into your spending habits to help you budget. Our thoughts: Year-end summaries are offered by most major credit card issuers nowadays, so this Visa Signature® perk doesn’t stand out too much. But it can come in handy for analyzing your budget or for preparing your taxes. Benefit summary: The Visa Signature® Warranty Manager Service offers a complimentary warranty extension on certain products you purchase with your Visa Signature® credit card. This benefit is available for products from U.S. manufacturers with warranties of three years or less. If the manufacturer warranty is less than one year, the term will be doubled when you purchase the item with your card. In order for products to be covered, you must register your purchase online or by phone. You can find the full terms for this service here. Our thoughts: If you’re the kind of consumer who keeps track of warranties and files a claim when applicable, then this is a nice benefit to have. It’s a bit of a hassle that you have to register your purchases in order to receive the extended warranty coverage, and the extension only goes to a maximum of one year past the original warranty. However, the coverage is as much as $10,000 per item, so it’s a worthwhile perk to have for expensive purchases. Benefit summary: The Visa Signature® website offers cardholders a variety of discounts and special offers for shopping, travel, sporting events and entertainment. Perks include access to over 900 Visa Signature® luxury hotels worldwide with a best available-rate guarantee, complimentary in-room Wi-Fi and many other benefits. You can also gain access to an exclusive reserve of preferred seats for sporting events, concerts, shows, dining experiences and more. Shopping benefits include a wide variety of Visa Offers + Perks, which provide discounts at dozens of merchants. Our thoughts: The Visa Signature® discounts and deals for entertainment, dining, travel and shopping provide a nice added value for cardholders. If you like to comparison shop online, the Visa Signature® online portal is a good place to start when searching for great deals on travel, entertainment and merchandise. 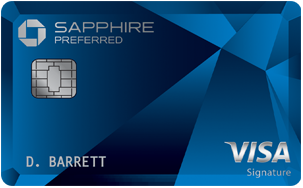 For consumers who are more interested in travel than cash rewards, the Chase Sapphire Preferred® Card is a great Visa Signature® card that offers numerous travel perks and ways to earn free travel quicker than some other rewards cards. To start, new cardholders can Earn 60,000 bonus points after you spend $4,000 on purchases in the first 3 months from account opening. There are no foreign transaction fees with this card and an annual fee of $95 — which is modest compared with high-end travel cards with annual fees as high as $450. For ongoing rewards, you earn 2X points on travel and dining at restaurants & 1 point per dollar spent on all other purchases worldwide. When you redeem points for travel via Chase Ultimate Rewards®, they’re worth 25% more. To top it off, the Chase Sapphire Preferred® Card has no blackout dates or travel restrictions and you can transfer your points on a 1:1 basis to many airline frequent flyer programs and hotel loyalty programs. Refer to your cardmember agreement for the specific terms and conditions of each benefit. 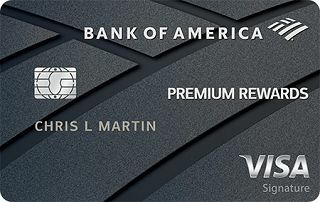 The Bank of America® Premium Rewards® credit card is another travel card that is backed by numerous Visa Signature benefits in addition to a rewards program. Cardholders earn 2 points for every $1 spent on travel and dining purchases, 1.5 points per $1 spent on all other purchases. This card really shines for cardholders who are also Bank of America® Preferred Rewards members. Depending on your Preferred Rewards tier, you can receive a 25-75% rewards bonus on every purchase depending on your tier. This means you can earn an effective 3.5 points per $1 on travel and dining purchases and up to 2.62 points per $1 on all other purchases. Terms may apply. New cardmembers have the ability to earn 50,000 bonus points – a $500 value – after you make at least $3,000 in purchases in the first 90 days of account opening. While this card has a $95 annual fee, if you spend at least $4,750 on travel and dining a year, you’ll recoup the fee. And, if you’re a Preferred Rewards member, you may only need to spend as little as $2,715 on travel and dining — depending on your tier. Visa Signature® credit cards offer a number of exclusive perks and benefits that aren’t provided directly from the credit card issuer. While some of the features in the Visa Signature® package aren’t too exciting and have small chances of being used, there are certainly some perks that are worth being aware of. Benefits like auto rental collision damage waiver and the warranty manager service have real potential to save you money if you put them to use. Also, perks like lost luggage reimbursement and roadside dispatch can give you peace of mind when traveling. While many cardholders may never utilize any of their Visa Signature® benefits, it’s always good to be aware that these perks are available should you need to use them. A 50,000 point American Express Premier Rewards Gold offer for new members?